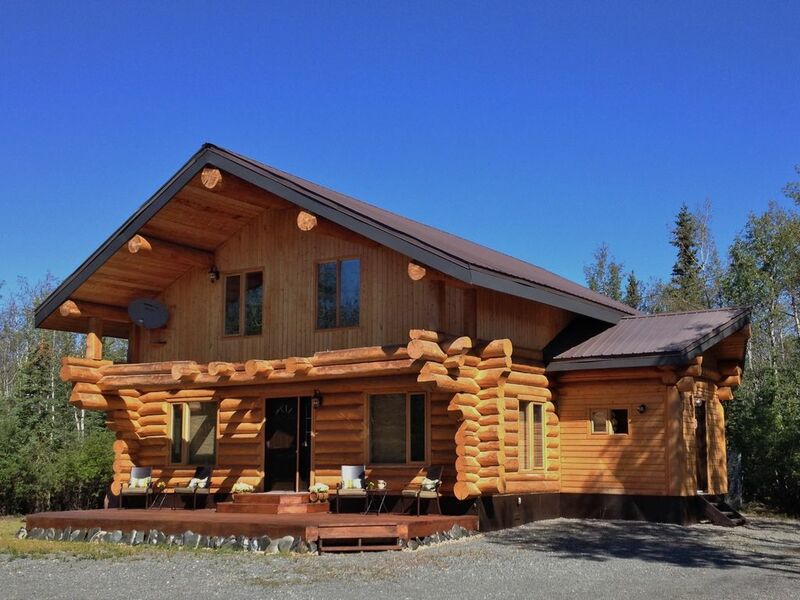 "Serene ~ Spacious ~ Stunning"
Haven in the Willows is a self-catered luxurious vacation rental located in a quiet and private country residential sub-division in Haines Junction, Yukon. Only 1.5 hour drive West on the Alaska Highway from the City of Whitehorse; this beautiful log home constructed from Yukon / Alaskan logs boasts 23 foot ceilings and over 1500 square feet of living space within a spacious open concept design. This private and serene property provides the right amount of tranquility and peacefulness to relax and “recharge” without sacrificing the amenities of home. With over 3 acres of private property and gorgeous views; Haven in the Willows is a perfect place to escape for romantic getaways, friends and family weekends or for sightseeing the area. The location is ideal! Haven in the Willows is less than 5 minutes from town center at the heart of Kluane National Park. It is the perfect “base camp” as you explore and enjoy the activities and adventures of the Kluane Region. The “cabin” is fully equipped with all the needs of home. From full service satellite TV and complimentary Wi-Fi to family board games and books. The kitchen is fully stocked for all your cooking needs as well as a large front deck for BBQ’ing. Luxurious beds and linens combined with “alarm clock free” bedrooms are sure to provide a restful sleep for your daily exploring of the area. It offers plenty of space for family vacations with an occupancy of six guests and provides separate living areas to still ensure your privacy. •Large front deck with propane BBQ and patio furniture; ideal for picnics and relaxing in the sun. Lawn games are also provided. Local calls only. Calling cards accepted. Phone book in home. 400 thread count sheet set with duvets. Assorted spices, paper towel, cooking spray, coffee, tea, sugar, hot chocolate provided. Place setting for 8. Assortment of glasses including juice, beverage, wine glasses. Large variety of cooking utensils. Main floor. Open concept dining area with eating bar at kitchen island. Balcony off loft. Seating for 2 with table. Haven in the Willows was everything we were looking for in a quiet week away. The cabin had all the comforts of home but was wonderfully private and peaceful. The kitchen had everything we needed, the beds were very comfortable, the place was very clean, and the photos don't do it justice - it is beautiful! The furnace kept us nice and warm, but we could have done with a couple more throw blankets for cuddling in the evening. We enjoyed a trip into Whitehorse for a day at the ski hill and then the Takhini Hot Springs, but other than that, stayed and enjoyed quiet time together as a family. We were hoping to see some nice Aurora displays from the back deck, but the conditions weren't quite right while we were here. Not much anyone can do about that though. We did have a couple evenings of nice star gazing. Thank you for such a great vacation! Thank you so much for your kind words. It is so meaningful to us to hear that our guests are so happy with their stay. Our "home away from home" is very special to us and it means a lot to share it with special people like yourselves! A piece of " heaven " in the willow. A spacious two stores log cabin very well suited for four people. The kitchen is extremely well appointed. Thank you for taking the time to submit your comments! We are very happy to hear that you stay was so enjoyable and all your expectations were met! Thank you for choosing our property! Top score for this rental! Beautiful, comfortable home, immaculately kept. The location is perfect for exploring Kluane National Park. The owners were very responsive to any questions. We highly recommend this home! Thank you so much for your kind words. We are very happy to hear that everything met your expectations and more! This was our first time in the Yukon Territory and our first impression was a great one. The owners were very easy to get in touch with, communication back and forth was excellent, helpful and very informative. The location of this home was in an excellent location for easy access to Whitehorse and Kluane NP. The arrangement was well thought out and made for great comfort and down time. We haven't slept in a beds as cozy as these in what seemed like forever. The cleanliness and organization of the home was well above normal standards. My hats off to the owners for an amazing job well done. The area itself is absolutely beautiful and the wildlife is out there if you time it right. Saw many grizzly bears, dall sheep, a couple lynx and a few moose. In the end, we didn't want to leave. VERY much looking forward to our return and highly nominate this as one of the top places we've ever stayed in and recommend it without a doubt!!!!! Thank you so much for your kind and meaningful words. It is so rewarding for us to hear that our guests take the time to show so much appreciation and gratitude to us. We are very happy to hear that all your expectations were met and definitely look forward to hosting you and your family with any future travels to Yukon. Non-Smoking Property; fee of $300 imposed if smoking in home occurs. Pets are permitted; dogs only up to 2. Pet fee of $20 a night; up to $100 per stay. Please inquire prior to booking if traveling with pet. Property can sleep 6 guests in 2 queen size beds and 1 double sofa bed. Fee of $25 charged if dishes are left unattended upon check out.